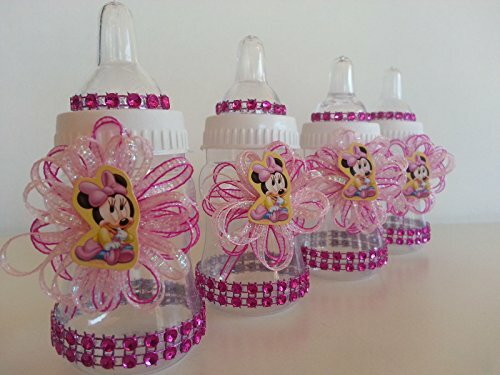 This Listing is for 12 Minnie Mouse Baby Bottles. Make This Your Special Gift for your guest to keep has a souvenir the bottles fit chocolate kisses, small marshmallows , candies, gummy bears, mints, you name it just so many uses. The Bottles Have A Small Hole At The Tip That Allows you to put candies or liquid for Games. Size: Approx. 4"x 1.5" Each One Of Them Is Handcraft And Made of Durable Plastic. The bottles include ribbon, Baby Minnie Mouse and rhinestones around.